While remaining tight-lipped on the renewal of its long-haul fleet, Austrian Airlines will move ahead with the modernization of its short- and medium-haul fleet as part of a strategy to defend its position at Vienna airport and better compete with the low-cost carriers (LCCs). The new strategy, dubbed #DriveTo25, calls for a €200 million investment to expand its Airbus fleet to 46 aircraft over the next three years from the current 36 A320 family narrobodies—six A321, 23 A320s and seven A319s—and the earlier than planned retirement of its turboprops. Austrian Airlines currently flies 18 Bombardier Q400s, all of which it plans to remove by 2021. The fleet investment, Austrian Airlines CEO Alexis von Hoensbroech said, reflects “a clear challenge to the increasingly tough competition in Vienna, and we are prepared to take further steps to defend our position at our flight hub in Vienna.” Vienna airport has seen a steep increase in LCC presence and capacity, including from Ryanair’s LaudaMotion, Wizz Air, International Airlines Group’s Vueling and Level, and EasyJet, which in 2017 established a new subsidiary there as part of its Brexit contingency planning. 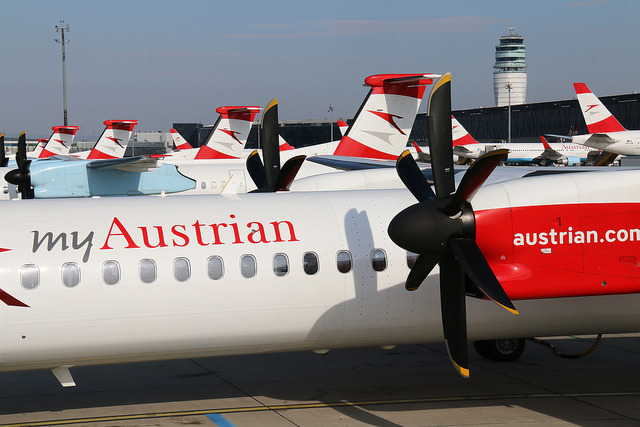 Even though the number of aircraft will decrease, overall seat capacity from Vienna will increase by 10 percent owing to the replacement of the 76-seat Q400s with larger jets. Austrian said it is developing a precise plan to determine when it will relinquish particular turboprop aircraft and when it will acquire the A320s. It gave no indication of whether the 10 A320s will be new or second-hand, or whether it will source them from parent company Lufthansa. At the end of December, Lufthansa awaited fulfillment of outstanding orders with Airbus for some A320ceos, 40 A321neos, and 68 A320neos. The gradual removal of the Q400s will eliminate complexity from the fleet structure. The routes deploying the outgoing Bombardier turboprops will see replacement by Embraer aircraft—it operates 17 E195s fitted with 120 seats—and Airbus single-aisle aircraft will ply routes now served by the E195s. The fleet renewal comes on the back of a year-on-year 8.5 percent growth rate in passenger numbers and improvement of its financial performance following years of restructuring and cost-cutting. “Austrian Airlines has managed the turnaround…and now operates profitably,” the airline said on Thursday. Operating profit for the first nine months of 2018 totaled €92 million, down 14 percent on the same period a year ago. The strategic program’s objective centers on enhancing Austrian Airlines’ profitability by reducing complexity, a stronger focus on the core business, and more focused concentration on the hub business in Vienna, noted CFO Wolfgang Jani. The subsequent next step calls for the modernization of the long-haul fleet. Six Boeing 767-300ERs, with an average age of close to 23 years, would yield to “more modern aircraft at some point in time,” the airline reckoned. Austrian also operates six Boeing 777-200ERs with an average age of close to 18 years.